Will the Silver and Euro Rally Continue? Are they related? During most of January silver price and the Euro/U.S. dollar sharply rallied from their slump of past months. These two indexes tended to have a strong relation in recent months, but has the relation between the two tighten? Could we explain the rally of silver price during January with the appreciation of the Euro? 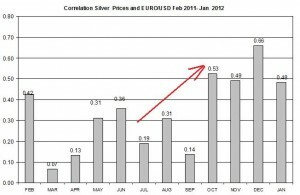 During January 2012, silver price rose by 20.1%; the Euro to US dollar also increased by 1.41% during the month and by 4.3% in the past couple of weeks. The EU Summit was held yesterday, January 30th and the EU countries have agreed to cut their budgets and monitor their fiscal policy. But the recovery of the Euro came earlier. There are several theories for the recent rally of the Euro including good news on Germany’s economy, the Fed’s pledge to keep rates low until 2014, the successful bond auctions of several leading EU countries (France, Spain) and other theories. For silver, the situation is different and some consider its rally to the entry of speculative traders to run this charge. Others attribute this price growth to expectations of manufacturing demand for silver to expand by 2.5% in 2012 compared with 2011’s demand. 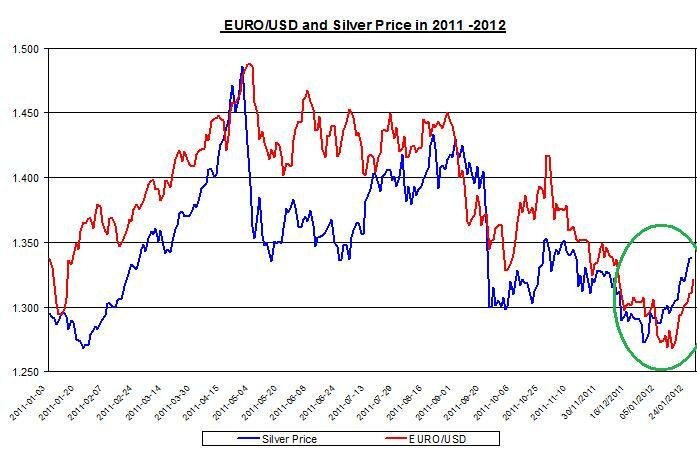 In the chart above are the daily prices of silver and Euro/US dollar in 2011 and 2012 (up to date). It seems there was a linear correlation between the price of silver and Euro/USD, during most of the year; this correlation however, wasn’t stabilize and changed frequently. The correlation tended to be strong and positive, i.e. 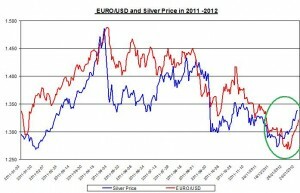 as the Euro/USD rose, silver price also tended to increase. 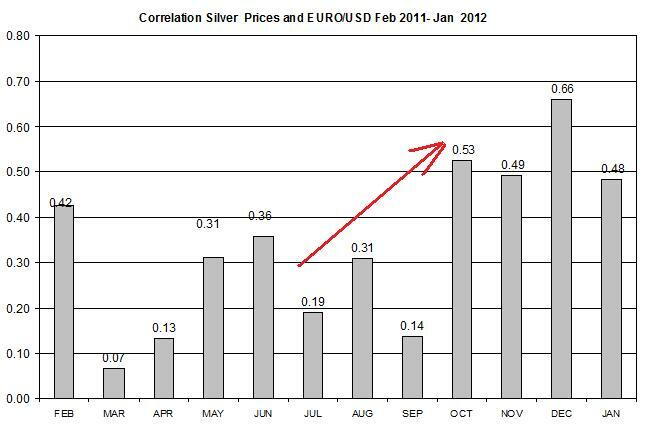 The following chart shows the correlation between the silver price and Euro/USD divided to months in 2011 and 2012. According to the chart, in recent months the relation between the two indexes has strengthened. Some of the relation might be explained via the U.S dollar: as the U.S dollar weakens against leading currencies such as the Euro, commodities prices tend to rise. But this doesn’t explain the stronger relation between the two. I haven’t found yet an interesting theory to explain this finding. If there was a fundamental change such as EU countries importing more silver, then it might have explained the stronger relation between silver and Euro. But this scenario is pure speculation and needs further evidence to support it. Note, correlation doesn’t necessarily mean causation and these findings should be taken with a grain of salt. Having said that, if the Euro will continue to recover from its decline of past months, it might also indicate that silver price will follow. This is by no means an investment advice only market analysis; please see here full disclaimer.